تقع Pacific Marina Apartments على بعد 350 متر من كوفس جيتي، وهي توفر شرفة أو فناء خاص مع منطقة جلوس في الهواء الطلق وإطلالة على الحديقة أو المحيط. ويتضمن مكان الإقامة مسبح في الهواء الطلق وبار للنبيذ ومنطقة للشواء. كما تتوفر مواقف مجانية للسيارات في الموقع. تقع Pacific Marina Luxury Apartments على بعد 5 دقائق سيرًا على الأقدام من شاطئ أوشن بارك ومسبح بِت بوربويز الشهير. ويبعد مطار كوفس هاربور مسافة 5 دقائق بالسيارة، بينما يقع سوق بيج بانانا على بعد 10 دقائق بالسيارة. تتوفر في جميع الشقق مرافق غسيل الملابس ومطبخ كامل يشمل غسالة أطباق وميكروويف. وتوفر كل شقة مكيفة الهواء منطقة جلوس واسعة تضم تلفزيون بشاشة مسطحة مع قنوات الكابل ومشغل دي في دي. يقدم مطعم Fiasco Ristorante الأطباق الإيطالية التقليدية في بيئة مريحة. ويضم بار النبيذ تشكيلة واسعة من الخمور المحلية والدولية. يقع Pacific Marina Luxury Apartments في مكان مناسب بالقرب من الحافلات وسيارات الأجرة ومحطة القطار. ويبعد مطار كوفس هاربور مسافة 8 دقائق بالسيارة. Great location..modern clean appartments. . The toilet wasnt clean on arrival. One bedroom was not available we were put in a 2 bedroom and asked not to use the second bedroom instead of a free upgrade. The trains were loud and ran right behind the apartments. Carpark was hard to access. 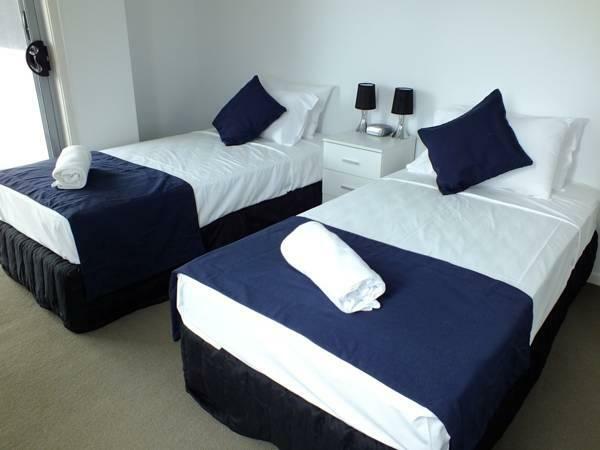 Pros were it was in a convenient location and the rooms had cooking facilities and accessories. This was a really great spot, and so comfortable, close to everything walking distance, the facilities were great. Easy to use however the parking is not big car friendly unfortunately tight getting in and out. The unit was $180 per night and it backed onto a railway line so whenever the train came by which was every 4-5 hours, it sounded like it was in the bedroom with us. They need double glazing. Could not recommend this to anyone. We liked the position near the Marina and beach. The apartment we had was excellent. The only downfall was that our bedroom was at the back and we were woken up by the very loud trains that went through at night. Expect to be woken in the night but freight trains passing by. Staff were really friendly and helpful. Although dated, not bad value for money. the location is very good and the room is very clean. we feel quite comfortable stay here. Self- check in as we arrived on Sunday felt a bit like'The Amazing Race'. Spacious apartment, with large balcony, great for entertaining friends over BBQ.Fully equipped kitchen a plus! Although located just beside the Pier, there is a rail track right behind the apartments. Not to fret too much as train passing is a rare occurrence. 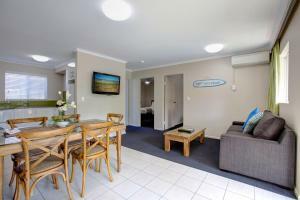 Very nice apartment, clean and tide, good parking facilities. The location relating to restaurants,shops and Harbour is great although be prepared to be constantly woken during the night by the train and its blasting Horn !! Unfortunately the WIFI was not available for the entire week and was told the "Tech was coming in" so not sure if this is a on going issue. Also note that the hotel will charge you an additional 1.5% credit card fee on top of the agreed price confirmed with Agoda. Not as advertised, not very clean, basic facilities not luxury. Hand basin in bathroom was broken, we reported it and it was repaired the next day. 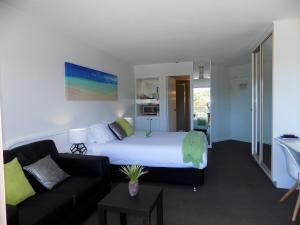 Very private rooms, quiet location, friendly and courteous staff, Judy Ken and Peg were very helpful and polite. Judy was very attractive! Gardens and surrounds are absolutely beautiful. Very close to the Jetty and restaurants. Very impressed with the standard of the apartment and luckily is time we got what we paid for (a little expensive though). 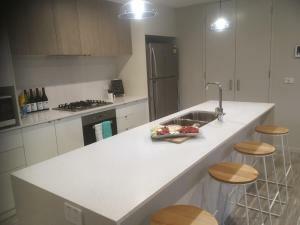 Large sitting area and fully equipped kitchen. Very large balcony on the side of the building so we were lucky to have both an ocean and a mountain view. Not in the centre of town and a taxi costs about $15 to get there but you are within a short walk (300 metres) of the jetty. The restaurant at the bottom of this apartment building was closed when we stayed but it looked like a clean and tidy Italian restaurant. The room was very well set out. The kitchen was well equipped and the bedroom was lovely. Upgraded to a two bedroom apartment with two balconies. Nice view of the jetty and beach from the main balcony. Apartment itself was very roomy with a well appointed kitchen. Liked the elevator access from car park and street level - no awkward stairs to navigate. As apartments are close to the main railway line, train noise was sometimes an issue.